Sightseeing, BBQ, Thai cooking class or sunset dinner at the amazing Jungle Route 360°. 12.00-12.30 Leave for Phutaboon Village Plantation, known as the “Kingdom of Fruits on the Mountains”. Then you will follow to Jungle Route 360°, the most beautiful viewpoint in Koh Samui. Enjoy unobstructed panoramic views of Koh Samui with its beautiful hills, Chaweng Cove, Cheongmon, Bophut, the surrounding islands like Koh Phangan, Koh Tao, Koh Matlang, Anthong and the Khanom mainland. 15.00-16.00 Elephant trekking about 15 min. along the tropical forest with a chance to feed the elephant (if the corresponding program is chosen). Namuang 2 Waterfall. Transfer to the hotel. Then you will travel to the south of the island where you can enjoy the rocks Grandmother and Grandfather. In the Muslim village, you will visit the coconut processing farm. You will see how trained monkeys gather the coconuts. By the way, the Latin name of the palm tree is Cōcos nucifēra, it comes from the Portuguese word coco (“monkey”) and is given because of the holes on the nut that make it look like a monkey’s face. After a short show, the monkey will pose with coconut and you can take a photo with it. On the farm, you can taste the coconut. If you wish, you can buy organic coconut oil of the first (cold) pressing, made on the farm. After coconut farm, you will have a long panoramic jeep ride along the jungle roads to the plantations of a village called Phutboon. You will be fascinated by one of the most unusual, impressive and very romantic places on Samui – a private viewpoint located at 615 meters above sea level, with a view of 360 ° degrees around and a very nice local restaurant – Jungle Route 360 °. This place can be called a small eco-settlement since the source of electricity here is solar energy, waste is sorted, organic waste is turned into compost for growing organic vegetables and fruits. If there is no fog, you will see Koh Phangan and Koh Tao, Bophut, Chaweng, Samui airport, the islands of the Angthong marine national park (primarily Paluai) and the coast of Khanom. 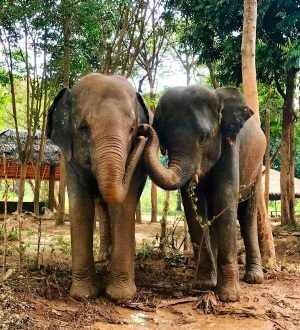 If you book a tour with elephant trekking, you will go to a local family farm where nine elephants are treated with awe and gentleness and fed ripe bananas (you can do it too). After fifteen minutes of jungle trekking and chatting with animals, you will travel to the last point of your journey – Namuang 2 waterfall, located on the territory of Namuang Safari Park, where you can refresh and swim in a cool waterfall. At this time on the waterfall, there is practically no one, and you can fully enjoy the beauty and sounds of the jungle. 08.30-09.00 Pick-up from your hotel by 4×4 jeep and transfer to Plai Laem temple with a striking white 18-arm image of Guanyin, the Goddess of Mercy and Compassion. 09.00-09.45 Visit the biggest Guan Yu Shrine in Thailand located in the Ban Hua Thanon community. Enjoy the harmony of 3 cultures; Buddhism Thai, Chinese and Islam that have been living together for over a hundred years. 09.45-10.00 Stop by to see Monkeys harvesting coconuts. 11.00-12.00 Elephant trekking (15 min) along the tropical forest with a chance to feed the elephant. 12.00-12.45 Visiting a local fruit farm and Koh Samui museum, Buddha statue at the Dipangkorn Temple located at the peak of the mountains. 12.45-13.00 Phutaboon Village Plantation known as the “Kingdom of fruits on the mountains”. Jungle Route 360°, the most beautiful viewpoint in Koh Samui. Enjoy unobstructed panoramic views of Koh Samui and its many beautiful hills, Chaweng Cove, Cheongmon, Bophut, plus the surrounding islands like Koh Phangan, Koh Tao, Koh Matlang, Angthong and the Khanom mainland. 13.00-14.30 Thai buffet lunch. Transfer back to the hotel. Half-day tour on all-wheel-drive jeeps runs each day with English-speaking and Chinese-speaking guide (daily). The tour lasts about five hours (09.00-14.30), this is a short version of the tour for those who want to have time for sunbathing and relaxing on the beach. You can choose the option with or without riding an elephant in a small family safari park with nine elephants. At first, you will visit the temple at Plai Laem – the temple with the statue of the Goddess of mercy Guan Yin. The temple is very colorful, so the photos turn out to be bright and unusual. Further, you will go to the south of the island, Hua Tanon, and visit the Chinese temple of Guan Yuya – the famous Chinese general, who lived 1800 years ago and is now revered as a god of war. The temple was built in 204, for the manufacture of the Guan Yu sculpture 20 million Baht was spent. Then, in the Muslim village, you will visit the coconut processing farm. You will see how trained monkeys gather the coconuts. By the way, the Latin name of the palm tree is Cōcos nucifēra, it comes from the Portuguese word coco (“monkey”) and is given because of the holes on the nut that make it look like a monkey’s face. After a short show, the monkey will pose with coconut and you can take a picture with it. On the farm, you can taste the coconut. If you wish, you can buy organic coconut oil of the first (cold) pressing, made on the farm. Further, you will visit the waterfall Namuang 2, located on the territory of Namuang Safari Park, where you can swim and relax. On the territory of the park at an extra fee, you can take a photo with a tiger or a leopard. If you book a tour with elephant trekking, you will go to a local family farm where nine elephants are treated with awe and gentleness, groom and cherish and fed ripe bananas (you can do it too). Then you will have an unforgettable ascent through the fruit plantations and jungles of the island to the highest point of the island where the Dipangkorn temple is located and several Buddhist sculptures are installed, including the famous Walking Buddha at the very top of the hill. Here you can visit the museum in Koh Samui. Afterward, you will have a long panoramic jeep ride along the jungle roads to the plantations of a village called Phutboon. You will be fascinated by one of the most unusual, impressive and very romantic places on Samui – a private viewpoint located at 615 meters above sea level, with a view of 360 ° degrees around and a very nice local restaurant – Jungle Route 360 °. This place can be called a small eco-settlement since the source of electricity here is solar energy, waste is sorted, organic waste is turned into compost for growing organic vegetables and fruits. If there is no fog, you will see Koh Phangan and Koh Tao, Bophut, Chaweng, Samui airport, the islands of the Angthong marine national park (primarily Paluai) and the coast of Khanom. Lunch is very tasty, with a large selection of traditional Thai dishes, including the famous Tom Yam and Pad Thai, and fresh fruits. You will have time to enjoy the wonderful atmosphere and take magical photos. After visiting one of the most beautiful places on Koh Samui it is time to go to the hotel! The staff will be very happy if you fill in the questionnaires by answering a few questions to improve the service. Tour runs on Monday, Wednesday and Friday. 08.00-09.30 Pick-up from your hotel by 4×4 jeep and transfer to Plai Laem Temple with a striking white 18-arm image of Guanyin, the Goddess of Mercy and Compassion. 09.30-10.30 Phra Yai local market with exotic local fresh fruits and vegetables. 10.30-11.30 Coconut’s farm in Maenam Village. 11.30-12.30 Jungle route 360° with a stunning view point. Enjoy unobstructed panoramic views of Koh Samui and its many beautiful hills, Chaweng Cove, Cheongmon, Bophut, plus the surrounding islands like Koh Phangan, Koh Tao, Koh Matlang, Anthong and the Khanom mainland. 12.30-14.30 Thai cooking demonstration (Som Tam, Chicken Soup in coconut milk & Fried chicken with chili paste) with a beautiful atmosphere followed by buffet lunch. 14.30-15.00 Jungle walk at the bamboo zone to explore the atmosphere of Samui mountain and experience cultivator lifestyle, see local orchard. 15.00-16.00 Samui Museum located at Dipangkorn Temple (Wat Dipangkorn), a temple with a superb panoramic view over the island. Then drive along tropical rain forest. 16.00-17.00 Waterfall Namuang 2, transfer back to the hotel. Minimum 4 people are required. 14:00-15:00 Pick up from your hotel by 4×4 trucks. 15:00-15:30 Visiting of the biggest Guan Yu shrine in Thailand, located at the Ban Hua Thanon community. Fishing village and local market. Enjoy the harmony of 3 cultures; Buddhism Thai, Chinese and Islam that have been living together for over a hundred years. You can also buy native delicacies and sweets. 15:30-16:30 Waterfall Namuang 2. Relaxation and swimming. 16:30 Local fruit farm. Koh Samui Museum. Buddha statue at the Dipangkorn Temple located at the peak of the mountains. 17:00-20:00 Phutaboon Village Plantation, known as the “Kingdom of fruits in the mountains”. Jungle Route 360°, the most beautiful viewpoint in Koh Samui. Enjoy unobstructed panoramic views of Koh Samui and its many beautiful hills, Chaweng Cove, Cheongmon, Bophut, plus the surrounding islands like Koh Phangan, Koh Tao, Koh Matlang, Anthong and the Khanom mainland. Enjoy your BBQ buffet & a variety of delicious Thai food. 20:00-21:00 Return to your hotel with unforgettable memories and experiences of Jungle 360°. 17:00-17:30 Pick-up by 4×4 trucks at meeting points at Maenam & Lamai. 17:30-20:00 Journey to Jungle Route 360° located 600 meters above sea-level. This is the most beautiful viewpoint in Koh Samui. Enjoy unobstructed panoramic views of Koh Samui and its many beautiful hills, Chaweng Cove, Cheongmon, Bophut, plus the surrounding islands like Koh Phangan, Koh Tao, Koh Matlang, Angthong and the Khanom mainland. Enjoy a BBQ buffet & a variety of delicious Thai snacks. 20:00-20:30 Transfer to the drop-off points at Maenam & Lamai. Tour runs on Tuesday, Thursday and Saturday. 08:00-09:00 Pick up from your hotel by 4×4 trucks. 09:00-09:30 Depart for “Coconut Farm”. Experience life in a traditional coconut farm and watch what can be made of an ordinary coconut. 09:30-10:30 Guan Yu Shrine located at the Ban Hua Thanon. Fishing village, local market. Enjoy the harmony of 3 cultures; Buddhism Thai, Chinese and Islam that have been living together for over a hundred years. 10:30-14.30 Phutaboon Village Plantation known as the “Kingdom of fruits in the mountains”. Jungle Route 360°, the most beautiful viewpoint in Koh Samui. Enjoy unobstructed panoramic views of Koh Samui and its many beautiful hills, Chaweng Cove, Cheongmon, Bophut, plus the surrounding islands like Koh Phangan, Koh Tao, Koh Matlang, Anthong and the Khanom mainland. Thai cooking class Som-Tam (Papaya Salad), Tom Yam Goong (King Prawn in spicy and sour soup) & Thai Dessert (Banana Sweet in coconut milk). Buffet lunch. 16:00-17:00 Samret Temple. This unique temple has images of Buddha cast from reclaimed coral. All these unique images depict the essence of the islands; spiritually and physically. Transfer back to the hotel. Reviews for "Jeep safari route 360"
A very funny guide Tony, with whom we laughed to tears, he told various funny stories while we waited for those who were lagging behind. After carrying us a lot of useful and interesting information related to the Play Lai temple complex and the Big Buddha temple. Very impressed by the figure of the goddess of mercy Kuan-Yin. My husband dreamed to see the Big Buddha with his own eyes, and now the dream has come true! Next were the coconut and rubber plantations and, accordingly, coconut tasting and a master class on the extraction of rubber juice. I remember Jungle Road Park with a viewing platform and a Thai-style lunch. And it was also cool to ride the hellish road that sits on the jeep’s cab))) Perhaps the most impressive impression was left by the waterfall, because I literally climbed right into HIM) unknown gave. And this is no joke, because I still have no pain in my back and neck. This tour is carefully put in my piggy bank of memories) Thank you so much!